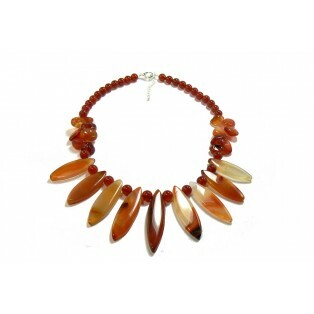 I have made this Carnelian necklace using genuine carnelian gemstone beads. There are 9 marquise shaped beads showing the different tones of carnelian from the dark orange/red through to the clear pale orange and almost white. I have added some fancy drop nuggets too and finished it off with 8mm round strong red carnelian beads. The necklace measures 46cm (18") long and I have added a "Nickel Free" silver plated clasp and extension chain to comply with EU directives.